Billowing white clouds rise up towards the sky, and the drizzling rain only adds to the eerie feeling I get. I’m in Beppu, on the Japanese island of Kyushu. The steam, too light to be seen as smoke, looks completely different to anything I have ever seen before. 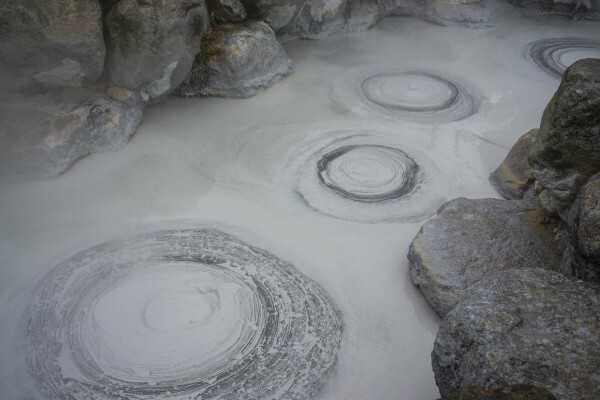 The Kanazawa Jigokus are volcanic hot springs where you can gaze at the bubbling, frothing volcanic water rise into the sky. Bear in mind, these hot springs are just for looking, not for bathing! While you may not get to immerse yourself completely in hot water while dreaming of the delicious Japanese delicacies you can have after you bathe, the beauty of the steaming water (and mud) was enough to pull me away from the numerous bathing-friendly hot springs of the region. Here is what to expect when you visit the Kanazawa Jigokus of Beppu. There are eight jigokus (or ‘hells’, as the word means in Japanese) in the Kanazawa region, and almost like in a theme park every hot spring offers something completely different. All of them are easily accessible and can be reached by foot or a short bus ride. The individual jigokus are surrounded by souvenir shops and often small zoos and aquariums, so don’t expect a tranquil hike around the hot springs. However if you don’t mind indulging in the touristy kitch, you’ll get a feeling of walking through a miniature Disneyland themed around bubbling hot springs. The waters of Umi jigoku would look like the most beautiful, clear water to bathe and relax in, if it wasn’t boiling hot. The spring water is crystal clear, with the gardens around it staying lush and green due to the condensation from the jigoku. The area is covered by even more smaller springs, and there is a greenhouse which runs completely on energy won from the steam. The lily pads in there are probably the biggest and most beautiful I have ever seen. The next jigoku looked like what a real mud bath should look like. Frothing and doing what I have never seen mud do – literally steam. The main draw of this jigoku is its unique appearance – so foreign to people who don’t live in a volcanic area. My favourite spring was the Kamodo jigoku. It wasn’t just the funky demon statue overlooking the water that did it for me; this was the jigoku with relaxing foot baths and excellent food! Puddings, corn, eggs and other delicacies are all available to eat after being cooked over the hot spring’s steam. Being fond of a good ol’ hard-boiled egg, I went with that. The vapor form the water made the egg taste salty and firm – no additional salt needed. The corn was also crunchy and salty, tasting much healthier and better than corn covered in salt and butter. The couple of the hot springs are surrounded by an aquarium (at Shiraike jigoku), a small zoo (at Yama jigoku) and a crocodile-breeding farm (at Oniyama jigoku). Although looking at the different animals and fish was a cool add-on, the springs themselves were still more mesmerising. Unfortunately the animals are kept in quite small enclosures, which takes away the charm a little bit. The two furthest hot springs of the area are just a short bus ride away. The Chinoike jigoku is a lovely red colour – a striking contrast to the green, dew-covered foliage behind it. 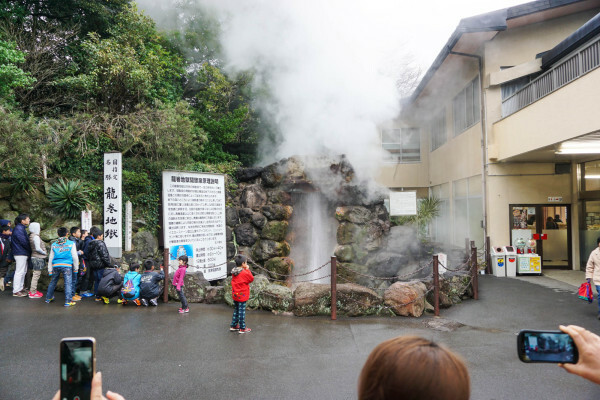 Tatsumaki jigoku is what many people come for – it has a geyser which shoots up frenzied steam and water every 30 to 40 minutes. Children peer over the fence waiting for the spectacle to start, while a repeated announcement tells you about how this geyser shoots up more often than the one in Yellowstone National Park in the United States. The wait for the geyser can seem slightly tedious with the same announcements being made over and over again, but it’s worth it to see water erupting at such force. Although a rock formation around the geyser restricts the water from reaching its full potential, you can see the heat marks etched onto the rock and imagine how high it could go. The steaming jigokus really added a twist to my stormy day. It seemed so foreign to have something that hot rising into the sky on a day where I was walking around in my wellies. 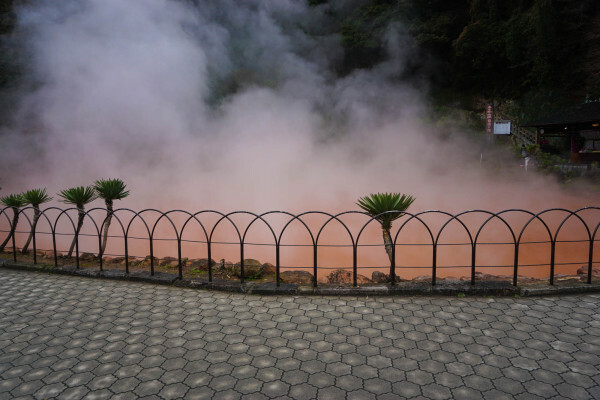 The hot springs are a delight for foodies and photographers, and definitely worth the day trip from Beppu. Also for those who love bathing their feet in lovely warm water – I don’t think you can ever get sick of that. 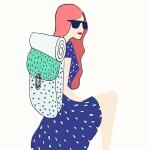 This is a guest post by Olivia Clarke, who blogs about her travels here. All photos by Olivia Clarke, except photo 1, by Fredrik Rubensson via. That looks amazing! Adding it to my bucket list now!! 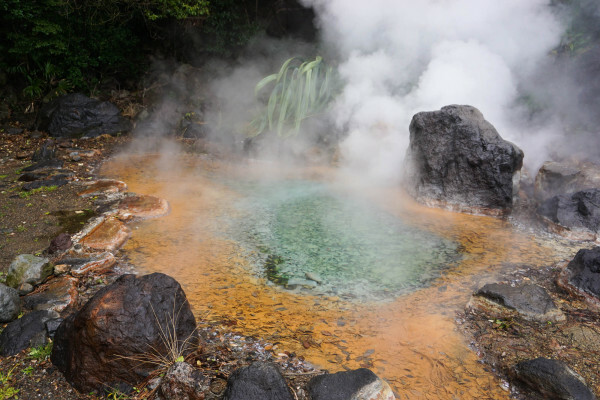 I have also seen those jigokus firsthand and I have to agree with Mallee that the place is a lot similar to Rotorua but with a Japanese flair and foot baths. I would also like to note that close to the aforementioned jigokus is Myoban hot spring, which is also worth going to. It has thatched huts used to grow/form yunohana crystals from hot spring minerals, which are used to create mineral baths. This place also has a natural mud bath, which is said to be great for the skin. That's another unique experience that you can add to the list above, which is unique to Beppu!